Concrete-effect slabs in porcelain stoneware. A warm gray tone that transforms concrete into a compelling, evocative element of interior design. 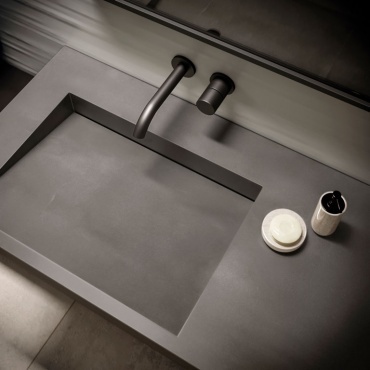 Boost Smoke recreates sophisticated, welcoming spaces, its dark hues and subtle contrasts softening the tactile force of concrete. Porcelain slabs in the size 162x324 cm are available in the matte finish with thicknesses of 6 and 12 mm. Suitable for covering kitchen tables, islands, cabinet doors, worktops, backsplashes, bathroom vanity units, countertops, sinks, bar and restaurant counters. Boost Smoke Habitat: for these bathroom compositions, Boost Smoke matt is paired with the products Boost Smoke, Boost 3D Urban Pearl and Boost White by Atlas Concorde which create a visual impression of continuity and harmony. A mood with neutral, elegant colours, ideal for industrial-style lofts and spaces with modern, minimalist design.